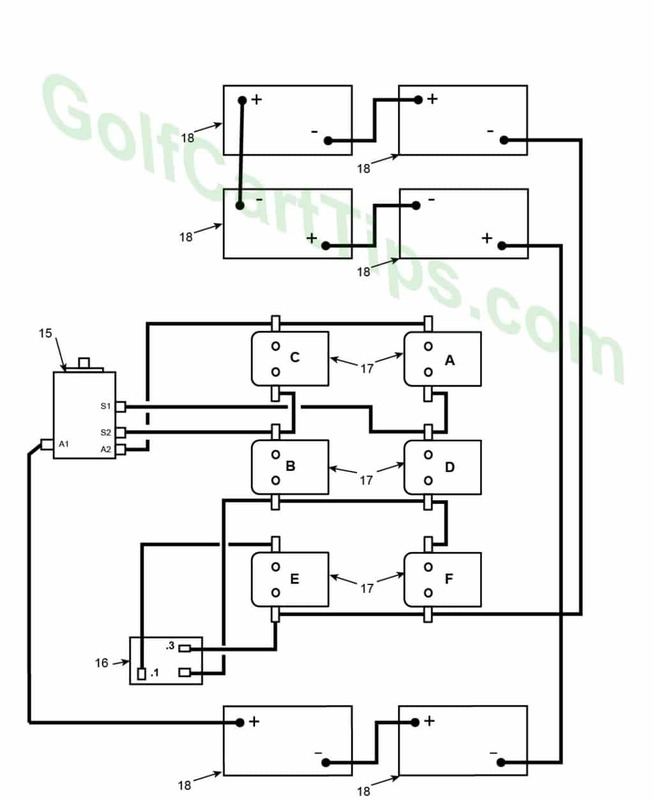 The control circuit is split up into two circuits: a 16 gauge solenoid control circuit and a heavy gauge motor circuit. The charts below separate the two for clarification. Current to the motor from the batteries through the heavy gauge cable is controlled by the solenoids. 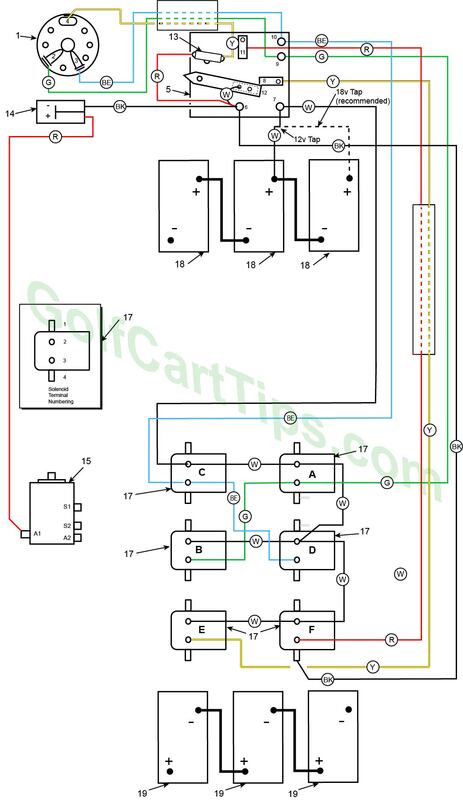 The solenoids that connect this circuit are controlled by the lower voltage (12 or 18-volt) 16 gauge circuit which includes the key switch, the microswitch, the speed switch, and the solenoid coils. 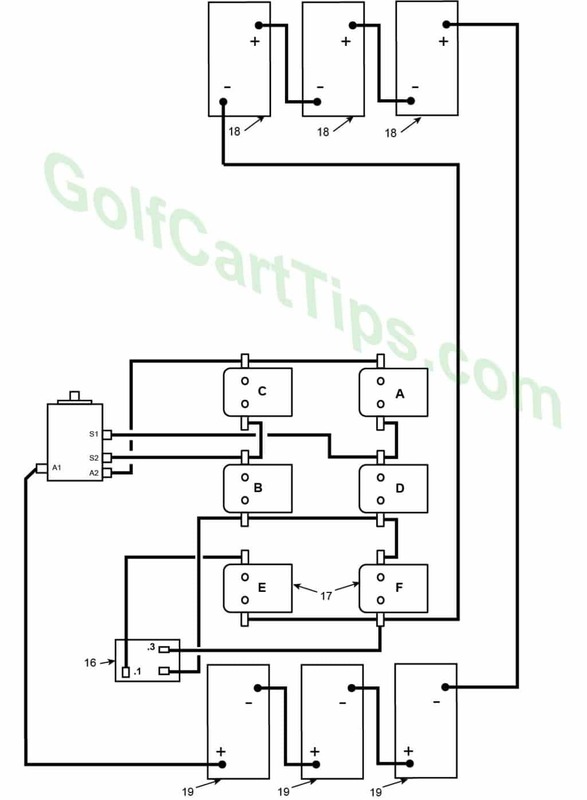 The speed of the cart is increased and decreased by selected solenoids switching through taps on a resistor. A 12-volt tap operates the 16 gauge system and came as an original configuration on the 1963-66 carts, but the 18-volt tap (pictured in the diagram) is now recommended for a more reliable operation. The microswitch on the speed switch controls the first speed only. Second and third speed is controlled through the speed switch contactors. 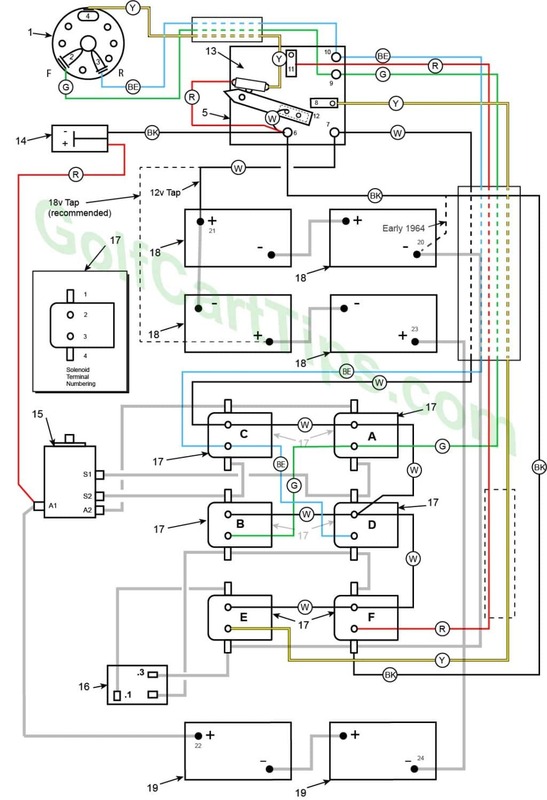 There are solenoids in both the gas models and the electric models. In the gas cart, the single solenoid engages the starter pinion gear with the “flywheel” gear on the engine, then releases after it starts. On the Electric model, a series of solenoids operate the forward and reverse functions of the electric motor and select different tap points on the resistor to change speeds. 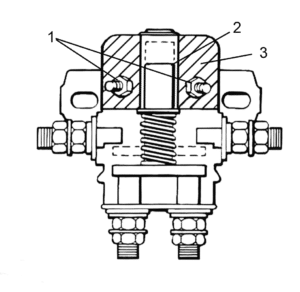 A solenoid is a switch…it is used to complete a high amperage circuit that would over-power smaller and more delicate contacts in the switch. The switch, rather than take the brunt of the snap of electricity, supplies a lower voltage to the terminals (1) which powers the electromagnetic coil (3). The magnet pulls the contact shaft up into the coil, overpowering the spring and bridging the connection (as shown by the dashed outline). Sometimes the moving contacts get welded to the stationary blades and stay stuck in the closed-circuit mode. Other times the coil (3), which is a winding and continuous thin wire wrapping a metal core, burns out. When this happens, the moving contact stays open. Both of these situations are not repairable and the solenoid must be replaced. 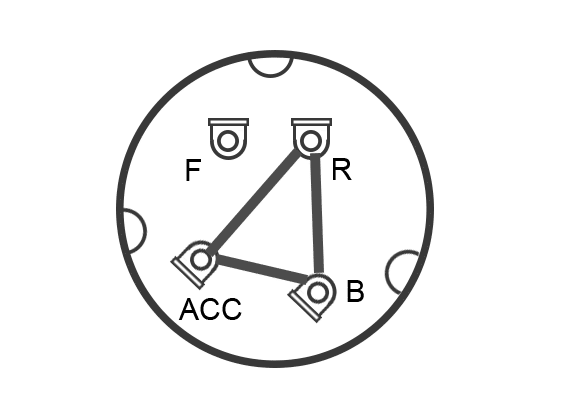 When the Speed Switch wiper arm is properly adjusted, it will be against the stop and in solid contact with the first-speed switch block, AND the foot pedal is at the rest position. When the foot pedal is fully depressed the wiper arm must have tripped the microswitch and be against the fourth contact block. 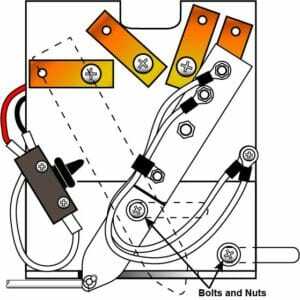 Loosen the nuts on the back side of the speed switch in the locations shown at right and slide the switch assembly until the wiper arm just comes in contact with the stop. Press the accelerator and make sure the microswitch trips. If it doesn’t quite make it to the tripped point, the pedal stop will need to be ground down until the switch can trip. This test needs to be done with a battery-powered continuity tester. Use the continuity tester and perform step 1. The light should come on in 1.8 seconds. If the light comes on immediately or doesn’t come on at all, the unit is bad. Perform step 2. The light should not come on at all. If it does, the unit is bad and needs to be replaced. This test may be done with a battery-powered continuity tester or an ohmmeter set to X1. Switch in the “OFF” position. Check for continuity between all terminals and the case of the switch. There should be no reading or continuity. Switch in the “FORWARD” position. Check continuity between F and B terminals. There should be a reading and continuity (light on). Switch in “REVERSE” position. Check continuity between R, ACC and B terminals. There should be a reading and continuity between any combination (light on). Key in “OFF” Position. No continuity between any of the terminals and/or case. Prior to actually removing the Traction Motor from the cart, there are some in-cart tests that can be performed. These test can be done with the continuity tester. 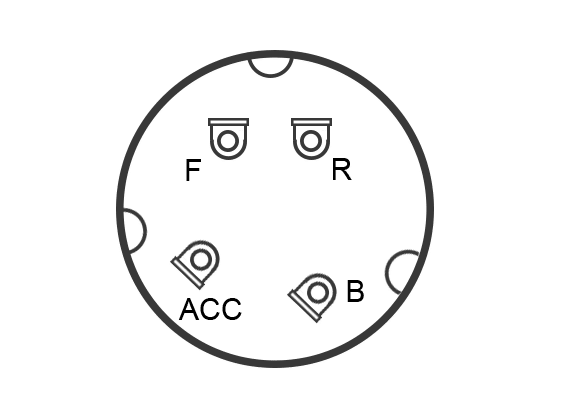 Motor wires A1, A2, S1, and S2 must be disconnected before testing to ensure there are no false readings from the heavy gauge motor circuit. Connect one lead from the continuity tester to the cart frame and with the other lead, test each of the motor terminals (A1, A2, S1, and S2). The tester SHOULD NOT LIGHT. This would indicate an internal ground in the motor. Check continuity between terminals S1 and S2. The tester should light and show continuity between S1 and S2. If there is no continuity, this indicates a broken or open condition in the field. The above diagram is correct for the 1963 through 1965 model DE. The 1966 model changed from a belt drive to a direct drive axel requiring the motor to rotate in the opposite direction. The key switch connections changed so that FWD becomes REV for solenoids A and B and REV becomes FWD for solenoids C and D. The battery configuration also changed to three in front and three in back. Driving with foot on the brake Don’t…this will wear out the brakes prematurely as well. Solenoids inoperative Listen for solenoid clicks, and if no sound check wiring to terminals. Check solenoids with testing procedure. 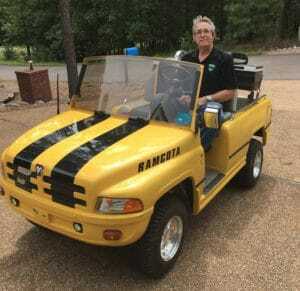 These charts and illustrations are to be used in aiding the repair and maintenance of your Harley Davidson golf cart. The illustrations and language will be updated and more details become available.